Great decision today lifting the stay imposed on the DADT court victory. Curious if our advocates are pushing for a lifting of the stays imposed on favorable DOMA rulings (given that they were imposed prior to the recent DOJ declaration that DOMA was unconstitutional). Wouldn't such a decision lifting the stay on federal marriage benefits provide immediate relief for many binationals? I think it's important that everyone know just how lucky we are to have an organization like StopTheDeportations. The work they are doing is remarkable! Please email all your friends and family and spread the news, please ask them to donate to this non-profit organization. 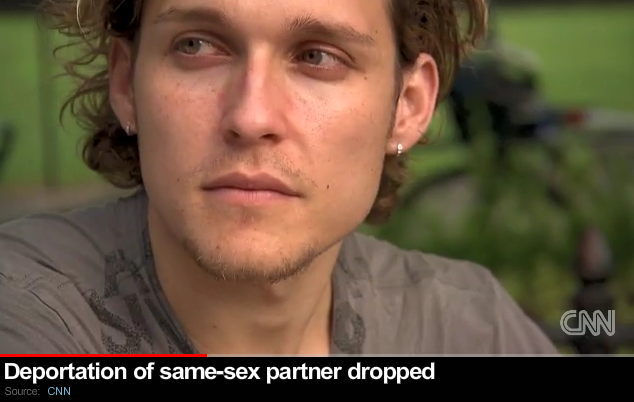 Every little bit helps couples like us in Exile and others facing deportation because of DOMA. This also paves the way for many, many folks in the future. Gavern and Brian Harrison.